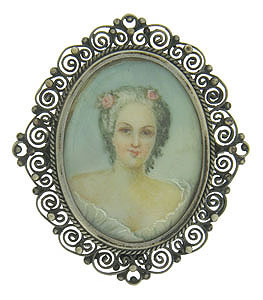 This romantic antique portrait pin features a porcelain skinned beauty in a powdered wig. Delicate pink roses press into her silver curls. The rosy skin lady is wrapped in layers of foamy lace. 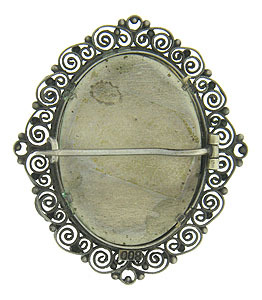 A delicate frame of 800 silver dotted with bold milgrain frames the lovely portrait. Finished with a simple pin back, the antique pin measures 1 1/4" x 1". Circa: 1900.